Posted on November 13, 2017 at 9:50 am. Quickspin is set to release a brand new slot on Tuesday, and to celebrate Dunder online casino is giving players the chance to claim 30 free spins. Mighty Arthur is a 5 reel and 20 payline slot set to be released at participating Quickspin casinos, like Dunder, this week. It features a simplistic game structure and the minimum bet starts at 0.20 and goes up to 100. All you have to do to claim the 30 free spins is make a deposit at Dunder on November 14. 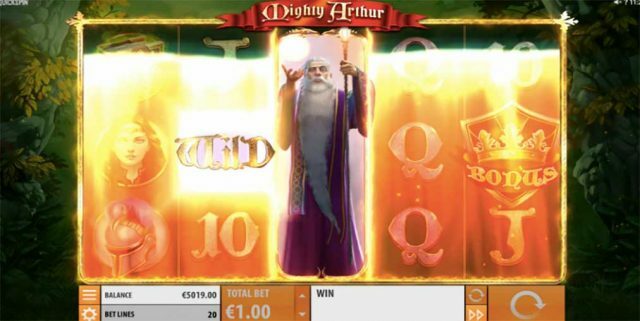 The spins will then be credited to your account to use on the new Mighty Arthur slot. Winnings from free spins promotions at the online casino are required to be wagered 25 times before you can make a withdrawal. The best games to clear the wagering requirements are the slots as they contribute 100 percent to the turnover rate. You will need an account with the online casino, so if you don’t already have one go to Dunder online casino and enter your details to create one. Once you’re all set up you can go to the cashier and make a deposit to get playing real money slot games. Mighty Arthur is set on a mystical back drop featuring an enchanted forest, and includes the standard style A, K, Q, J and 10 playing card symbols, as well as goblets, spell books, helmets, King Arthur, a queen and Wilds. The Merlin Random Wilds are active in both the base game and the Free Spins bonus round, and when one appears on any of the 5 reels you can score between two to six extra Wilds for big wins. Three Scatters will activate the Free Spins bonus, scoring you 10 free spins, while the Arthur Wild symbol appearing on reel 3 during the base game and free spins feature will activate Expanding Wilds for large payouts. There’s also a nudge feature on the new slot by the innovative casino game developer, Quickspin. You can play any of these games provided you don’t live in the US and its territories, Afghanistan, Algeria, Belgium, Bouvet Island, British Indian Ocean Territory, Bulgaria, Comoros, Czech Republic, Denmark, Ecuador, Estonia, Ethiopia, France, Greece, Greenland, Guam, Holy See (Vatican City State), Hong Kong, Hungary, India, Indonesia, Iran, Iraq, Israel, Italy, Jordan, Democratic People’s Republic of Korea, Kuwait, Libya, Malaysia, Montenegro, Myanmar, New Caledonia, Nigeria, Pakistan, State of Palestine, Philippines, Poland, Portugal, Romania, Singapore, Slovenia, Somalia, South Africa, South Georgia and the South Sandwich Islands, South Sudan, Spain, Sudan, Syria, The Faroe Islands, Turkey, Western Sahara, or Yemen, where Dunder does not operate. However, you can check out our online slots guides to find alternative online casinos. For those who can sign up to Dunder, get to the online casino this Tuesday to score 30 free spins on Quickspin’s exciting new release.